Planning a road trip to Europe? Then you need to be properly equipped with the correct essentials, this is where Jayar Car Parts are here to help. Take a look at our checklist below. Each European country has different driving laws and rules on the equipment you should carry in your vehicle. That’s why it is crucial to check the laws in each country you intend to travel to or through, before setting off. 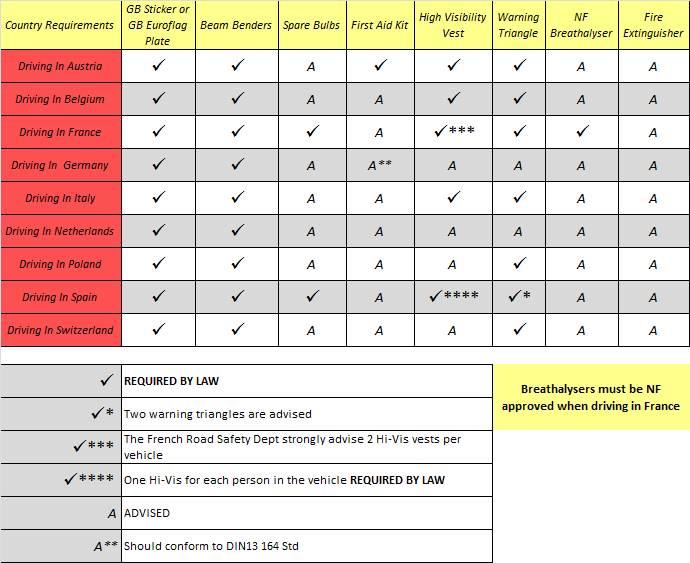 We have a massive range of essentials items for driving in Europe, some of which are a legal requirement. An all you need kit for Driving in Europe. Kit contents: warning triangle, 2 high visibility jackets, universal bulb kit, set of beam converters (beam benders) GB sticker, first aid kit, twin pack of NF approves breathalysers and a foil blanket. All packed in a compact carry bag. A warning triangle provides vital warning to other motorists if you have broken down and can help improve safety in emergency situations. They have a legal requirement in most EU nations, in Spain you need to carry two. When driving in France you are required by law to carry a self-test breathalyser (NF Approved) but there is no current legislation requiring a fine for non-compliance. Carrying a fire extinguisher is only advised by all European countries, however we strongly recommended keeping one in your car at all times. It is compulsory in Europe to display a GB sticker on your vehicle, unless your car already has number plates fitted that include the GB logo (euro plates). You are required by law in Europe to use beam benders/headlamp converters. This is because in Europe they drive on the right hand side of the road. Headlamps on UK vehicle are designed for driving on the left, therefore dazzling oncoming traffic. Fitting beam benders repositions the angle of your headlamp aim, ensuring the safety of other road users and giving you better visibility. Most European countries recommend that you carry a spare bulb kit, thus allowing you to change your headlamp bulb in the event of a problem. In France and Spain you must carry one by law. Many people keep a first aid kit in their car for emergencies. A first aid kit is recommended by every European country, in Austria it is required by law. It is compulsory to carry a high visibility vest in your car in most European countries. This needs to be kept inside the cabin - not the boot. In Spain one Hi-Vis for each passenger in the vehicle is required by law. Wishing you a safe & happy road trip!